Free Shipping Included! 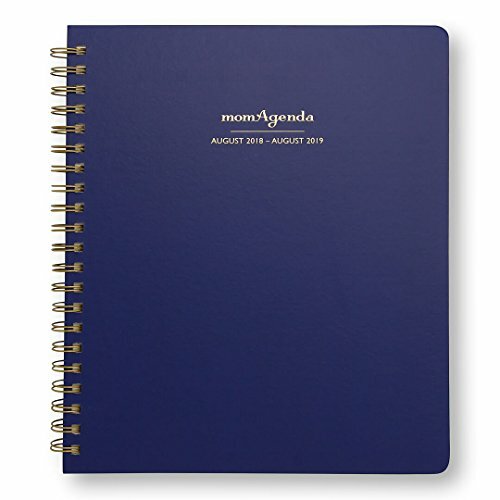 momAgenda Home Office Edition Day Planner (August 2018 - August 2019). Organize Your Busy Life with This Spiral-Bound, Large Planner and Convenient Week-at-A-View Layout. (Navy) by momAgenda at Transparent University. MPN: HOD. Hurry! Limited time offer. Offer valid only while supplies last. When you run a household, chances are there are days when it runs you. But the momAgenda Home Office Edition Day Planner gives you the advantage. When you run a household, chances are there are days when it runs you. But the momAgenda Home Office Edition Day Planner gives you the advantage. This spiral-bound, large planner is perfect for leaving at home on your countertop, where everyone in your family can see it each day. Like our original momAgenda, the Home Office Edition boasts our signature layout with space for mom and up to four kids. You'll enjoy monthly and weekly views with convenient monthly tabs, note pages and two folders for loose papers. And a fabulous quote each week keeps you inspired and motivated! 12-month calendar runs from August 2018 through August 2019. If you have any questions about this product by momAgenda, contact us by completing and submitting the form below. If you are looking for a specif part number, please include it with your message.